Having machines do complex, repetitive work previously pulled off only by humans is no longer wishful thinking. Thanks to machine learning developments, we can now reach formerly unfathomed levels of automation and data processing to obtain previously unseen information about our environment – all without the intrusion of our busy human brains. The current pace of digital disruption suggests that today the tech industry is experiencing the golden mean – companies are rapidly adopting machine learning, but the market still lacks competition. Machine learning experts at AltexSoft will help you adopt state-of-the-art practices and elevate your product or service among your rivals. By leveraging complex statistical methods and expertise in a range of ML algorithms and models including Deep Learning, we develop end-to-end machine learning solutions for your particular business needs. Extract useful information from images and surroundings for face recognition, biometrics, transportation, AR, and other use cases with computer vision algorithms. Glimpse into the future with the help of past and present data. Eliminate guesswork and learn how your organization, customers, or the whole industry will change in the future. Recommender systems Use the technology responsible for growing conversions in Netflix, Amazon, and Spotify. Provide your users with the most relevant content, deliver a personalized customer experience. Identify abnormal behavior to detect fraud, security issues, information breaches, medical problems, structural defects, and other malfunctions. Analyze behavior, find data patterns, build a customer segmentation model to allow better targeting, personalization, and overall customer experience. As you recognize the need for implementing ML, we study your tasks, assume the solution, and plan the scope of work and development process. During this lengthy but critical step, we analyze your data, visualize it for better understanding, potentially select a subset of the most useful data, and then preprocess and transform it to create a legitimate dataset. After that, we split the dataset into three sets of data: training, (cross)validation, and test sets. The first – to train a model and define its parameters. The second – to tweak the model’s settings and parameters to achieve the best results. And the third – to evaluate a real model’s performance to solve a task after training. After cleaning data and subtracting from it, we start adding to it in an essential data preparation process – feature engineering. The key element of spot-on model accuracy, feature engineering is about using domain knowledge to manually create new features in a raw dataset. This requires a deep understanding of a specific industry and the problem the model will help solve. Here we will train a few models to decide which one gives the most accurate results. We experiment with many different types of models, feature selection, regularization and hyperparameters tuning until we get a well-trained model – neither underfit or overfit. For each experiment, we evaluate model accuracy using the appropriate metric for exactly this type of problem and dataset. 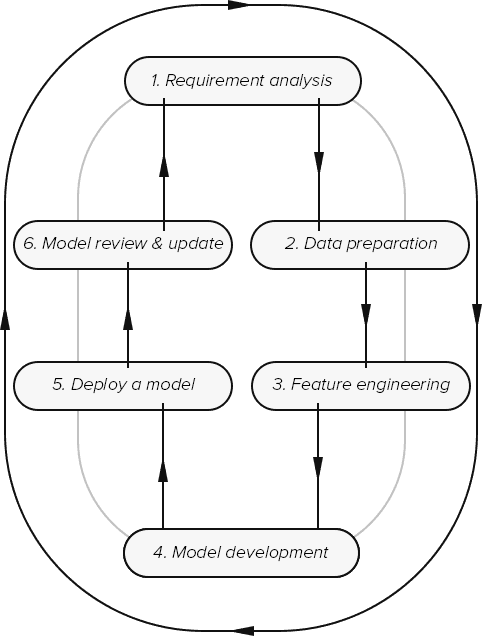 The process of putting a model into production depends on your business infrastructure, the volume of data, the accuracy of all previous stages, and whether you’re using machine learning as a service product. The project continues even after the model is completed. We will help you track the metrics and apply testing to define your model’s performance over time and improve it when needed. AltexSoft UX team has impressed me with their attention to how the business is supposed to work and how the user experience they suggest aligns with our strategic goals. Our communication started with elaborate interviews that synchronized our vision. Once it came to design, they delivered stellar results and always contributed their own expertise to the final product. I’m happy to work with AltexSoft and would recommend their UX team for challenging design and business analysis projects. AltexSoft’s commitment to precision in the overall planning and execution of the full development cycle ensures sustainable application growth with minimum redesign requirements and typical time wasted on short term, throw away projects. I highly recommend AltexSoft to well informed and educated clients who appreciate and understand the benefits of a holistic approach to application design and development, resulting in minimum cost of development and ownership.